Stuffed animal tea parties. Make-believe adventures. Bedroom safaris. A playroom shared between sisters is a place to play together, grow together and build memories for a lifetime. 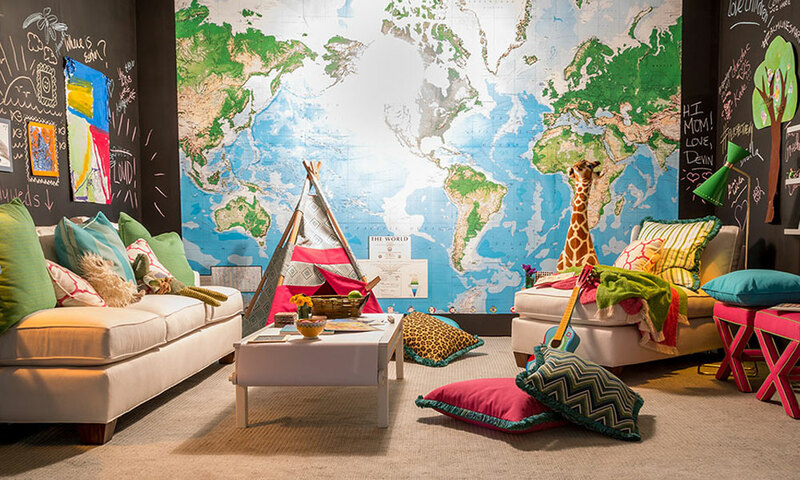 For her Perspective New York vignette interior designer Kate Jackson created a fun, playful children’s room. She taps into Sunbrella fabrics for a touch of sophistication that will grow with the child, while at the same time designing from that whimsical place that children inhabit. Jackson, whose beach house design is featured in Perspective New England, is one of five interior designers chosen to share their unique vision of creative excellence using Sunbrella fabrics for Perspective New York. The design event explores Sunbrella performance and style through the eyes of inspired and inspiring designers. Because it’s a children’s room, Jackson orients her vignette to floor level with a soft, barley-colored Sunbrella rug from Colonial Mills. She taps into a child’s sense of adventure with a custom fabric teepee featuring Sunbrella Canvas – Hot Pink available from United Fabrics and Silver State and Kanekopa – Akuatic, a graphical diamond pattern in white and aqua, from Kravet Fabrics. The colorful teepee is the perfect ready-made fort for any make-believe adventure a child can conjure. Jackson continues her focus on the floor-level with large floor pillows in Canvas Hot Pink and Canvas Aruba. Amongst the jewel colors, a decorative pillow covered in Cheetah – Safari provides a wild edge to the design. A craft table overflows with artistic and creative possibilities for all ages. Jackson covered the walls of her vignette with chalkboard paint and installed a floor-to-ceiling world map on the back wall. The space fuels the imagination and invites children to create make-believe adventures during play time. A sofa and chaise from the MT Company upholstered in Sunbrella Sailcloth Salt is piled with pillows in a variety of blues and greens. From the 2014-2015 Sunbrella open line collection there’s Dupione – Paradise, a ribbed aqua, lime green and yellow fabric, Canvas – Aruba, a solid aqua fabric, and Fischer – Lagoon that features tonal greens in a horizontal zigzag pattern. All fabrics are available from United Fabrics and Silver State. Decorative pillows covered in Surf, a white fabric with green and aqua chenille stripes from JF Fabrics, and Kanekopa – Akuatic round out the ocean-inspired hues. A native of Rhode Island, Jackson took the state’s interior design scene by storm about 10 years ago with designs that at once feel sophisticated and calming. She draws inspiration from her love of the ocean, her children and her clients’ lives. Her children’s room vignette transports us to a time when we could lose ourselves in adventures of the imagination.